Panel discussion on ‘Communicating Geoscience’: (L to R) Clive Mitchell, Hazel Gibson, Philip Essl, Anna Szolucha and Jen Roberts. Photo credit: Kirstie Wright, Heriot-Watt University. Dumber than a box of rocks; that was on the T-shirt my Dad bought for me way back. Amusing. Ironic. Upsetting. Does anybody want to know about anything other than dinosaurs and disasters? When geo-controversies hit the headlines, why are geoscientists woefully unprepared to engage with a public who have no clue what we do, but who can be manipulated by social media into a highly motivated opposition? Geologists like being seen as slightly eccentric, outdoor-loving scientists who understand the Earth, and yet we are portrayed as bringing forward the end of the world. GEO ExPro has been following these themes for some years, but the controversies just keep coming back. 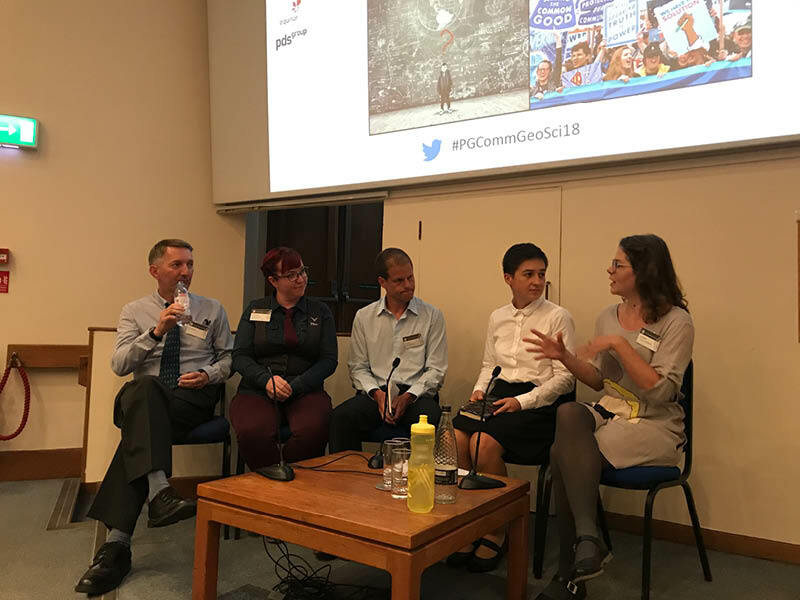 In September I attended the latest gathering to focus on how geological ideas could be conveyed across society: a Geological Society Petroleum Group event in London entitled Communicating Geoscience: Building Public Interest and Promoting Inclusive Dialogue. A broad topic – but unsurprisingly several of the talks and discussions returned to familiar defensive themes. We heard from Equinor how factions opposing fossil fuels want to legislate against exploration in the Norwegian Arctic and how the British Geological Survey (BGS) were caught out in 2011 by a minor earthquake in Lancashire and were overtaken by the frenzy of anti-frackers before they could mount an informed response. From Radioactive Waste Management we learnt that this is likely to be the next big topic to provoke the ugly side of protest. All three organisations feel that credibly presented science, operational excellence and demonstrating the importance of these activities should win the day. The result of communicating sometimes complex concepts to the general public is hard to measure. Some polls suggest that science makes little difference to changing the mindset of an uninterested majority or stubborn opposition groups. ReFINE, an international research consortium set up by two UK universities specifically to impartially investigate the effects of fracking, is not immune from criticism. Presenting unbiased results of study does not necessarily facilitate universal acceptance, if the science itself has become politicised. Despite this, I think most geologists would not want to duck the responsibility for presenting the right science. So what was suggested by presenters? Emphasise the bottom line: how will this affect you or why should I care? What is the role of this energy or these resources? Listen and take account of concerns. Show how these operations are to be executed and monitored so you can be trusted to take care of anxieties. Start public consultation earlier, bigger and better. The chances of a more positive outcome will be improved by a combination of consistently phrased messages whose presentations reach all the way to individuals in the community. There is a consensus that geoscientists should be more visible to the public and take advantage of any interesting news opportunities that promote our science. John Underhill reminded us of the cases of the southern North Sea Silver Pit meteorite crater (or not) and the possible identity of Homer’s Island of Ithaca in ancient Greece, which hit the press and TV several years ago. These were non-threatening dilemmas that caught the public interest but also were opportunities for geologists to explain our data and how they are used, whether seismic, satellite, outcrop or wells. I was surprised by the relatively low attendance at the event, many of them already active disciples, although the conference was live-streamed with at least three mini-conferences across the country. There was also a session called ‘Tools for Engagement’ – the blogging-YouTube-Twitter-Instagram world. We should embrace with open arms the latest geo-generation sharing with the world their interest and studies. There is good progress in the reporting and monitoring of environmental consequences of energy provision, but widespread acceptance of these studies is hard, given the perceived prejudices of many. So while industry cannot escape the requirement to tell the story effectively, the unbiased status of bodies such as the Geological Society and BGS should be conserved to allow public access to independent data and opinion. We should not curb our natural enthusiasm to promote our science and to excite the public on how our Earth works and where our resources come from. And if they don’t get it or are not excited, get a smarter box of rocks. "A Play for Oil: The Stories Behind the Discovery and Development of Oil and Gas" by Tim Daley. Springer, 2018. Effective resource management in a globalizing economy requires accurate assessments of fossil energy and minerals resources.